PHOTO SUBMITTED Summer Hunter-Kysor poses for a photo on the Heidelberg University campus in this undated image. 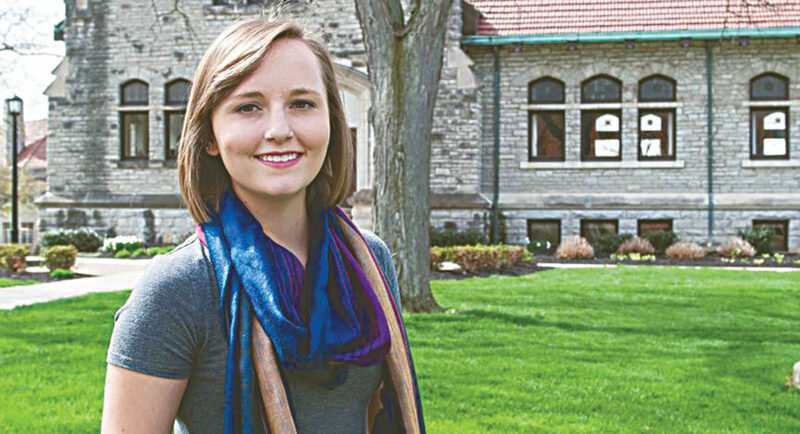 A recent Heidelberg University graduate has been selected to be a Fulbright scholar, to serve as an English teaching assistant for the 2017-18 academic year. Summer Hunter-Kysor is from Huntingdon, Pennsylvania, and is the first Heidelberg student to receive a Fulbright award from the Fulbright U.S. Student Program through the university while an undergraduate. Hunter-Kysor earned a bachelor’s degree in international studies and history from Heidelberg. She heard about being selected in April after months of waiting. Hunter-Kysor said she was notified while at a tennis match. Hunter-Kysor said she would check online and see other countries being notified. The application process included a 13-page questionnaire, in which she had to discuss what she studied, her qualifications and future plans. She also needed three references and two statements outlining her purpose in the program and a personal statement, which had to be only one page each. “It was difficult getting out all I wanted to say and meet their guidelines,” she said. Hunter-Kysor said she relied on her connections at Heidelberg and at Juniata College, where her parents worked. In August, Hunter-Kysor is to head to Germany where she is to spend her next academic year teaching English to German students. Hunter-Kysor is no stranger to Germany, having studied abroad as a high school junior and spending an extended semester last year at the University of Heidelberg in Heidelberg Germany as part of the local university’s American Junior Year program. Hunter-Kysor is to be in a German classroom about 15 hours a week. She also is to explore the possibility of an internship or taking classes at a nearby university. Her goals are to possibly work in foreign service and have as many experiences outside of the country as she can. Hunter-Kysor said while growing up, her family hosted exchange students from different countries and she had the opportunity to learn about the different cultures. Hunter-Kysor said she is looking into re-applying to graduate schools after her Fulbright program ends.